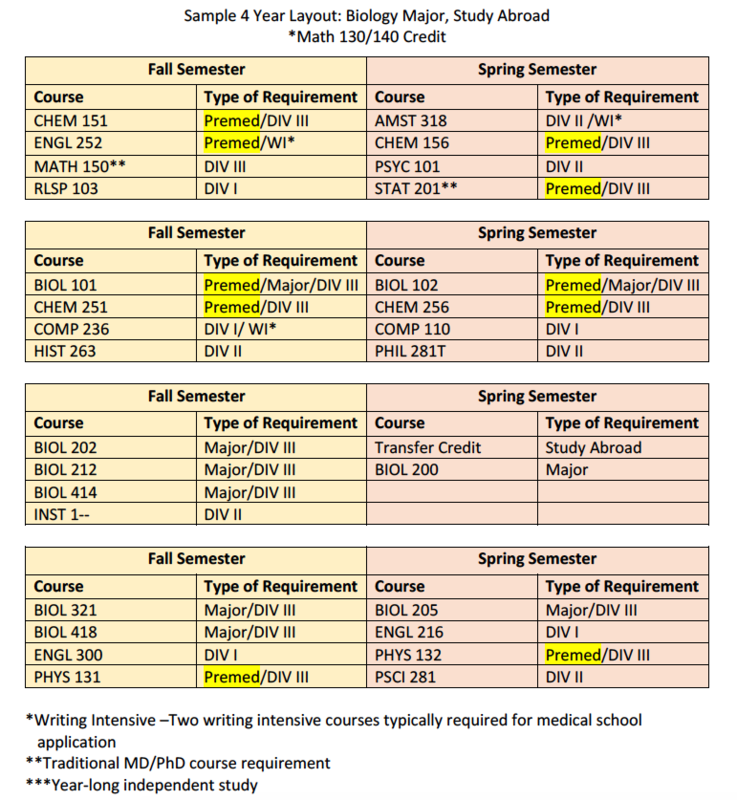 Planning your eight semesters carefully is key when considering a career in a health profession. With some judicious course selections, you can fulfill premedical/prehealth requirements; major in a non-science discipline; double major or add a concentration; study abroad; complete a thesis; and graduate in four years. 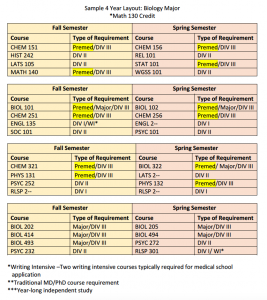 You are encouraged to consult with the Science and Health Professions Advisor, your first-year or major advisor, and course instructors as needed before making final decisions on courses. 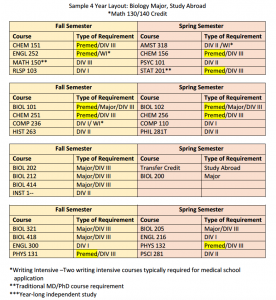 Set up a spreadsheet with your course requirements and selections for each semester so you can visualize how the premedical required courses fit with other Williams requirements. 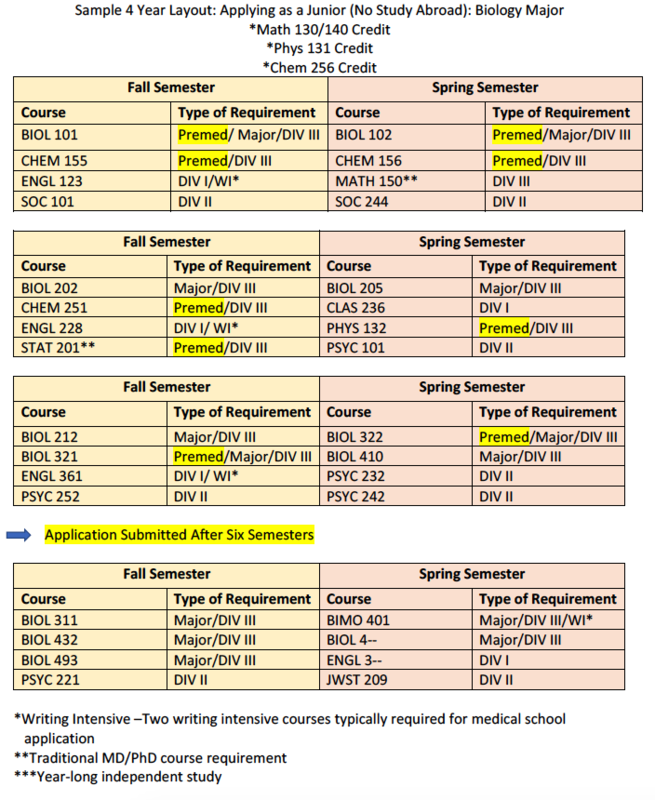 Keep the Registrar's webpage on distribution requirements bookmarked! 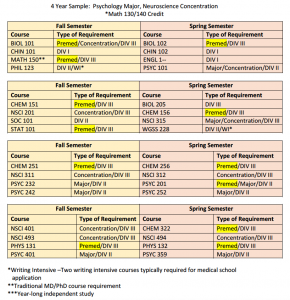 Note that AP courses may "count" toward prehealth course requirements. Most commonly, students use AP Calculus I and II courses for the math requirement. AP Physics is generally used for one semester of Physics. (You must have a 4 or 5 on AP tests.) See the Science and Health Professions Advisor for specifics. 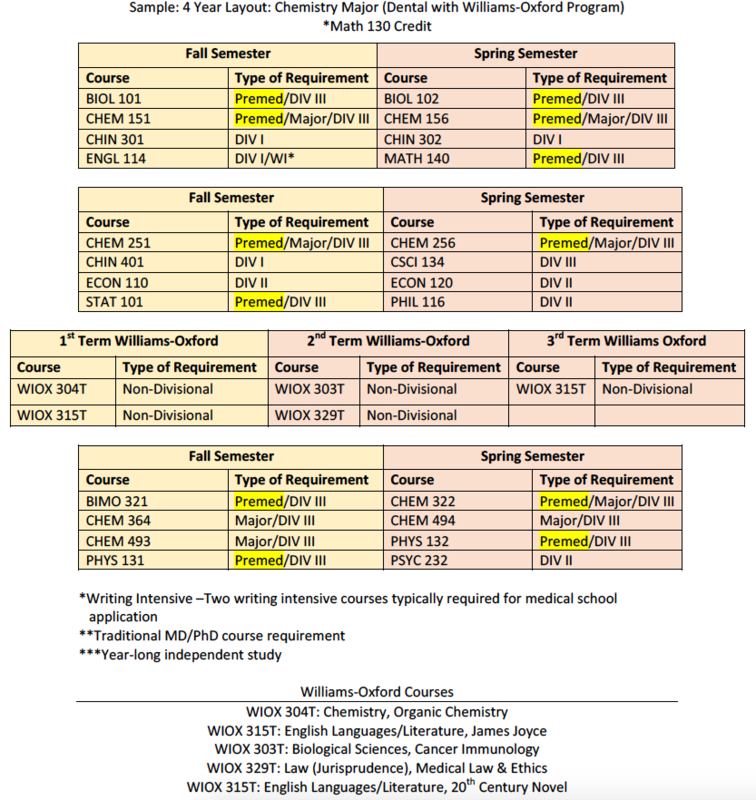 Select one or two laboratory science courses during both first-year semesters. 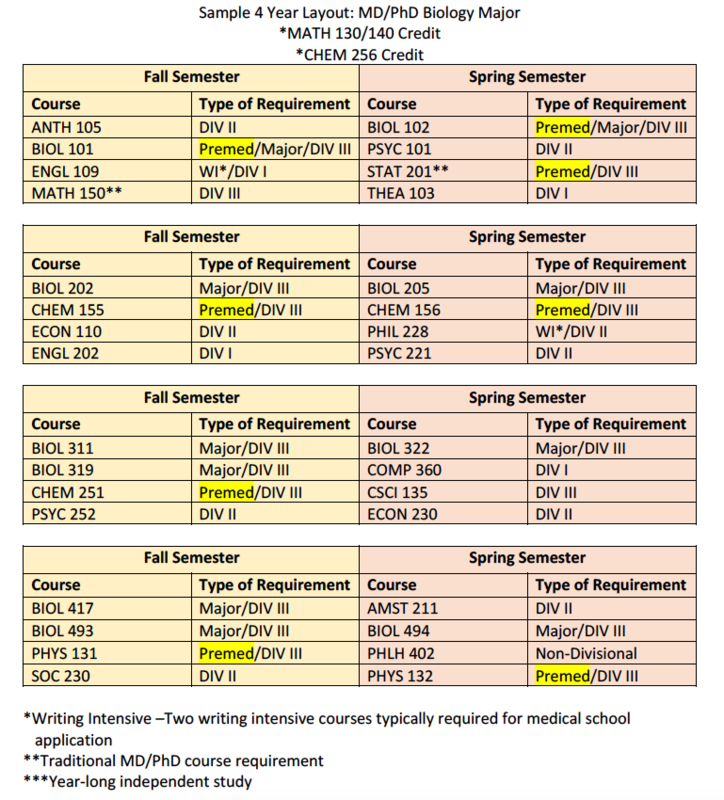 To study away in junior year, it is best to have started the four-course chemistry sequence (CHEM 153, CHEM 156) in first year. 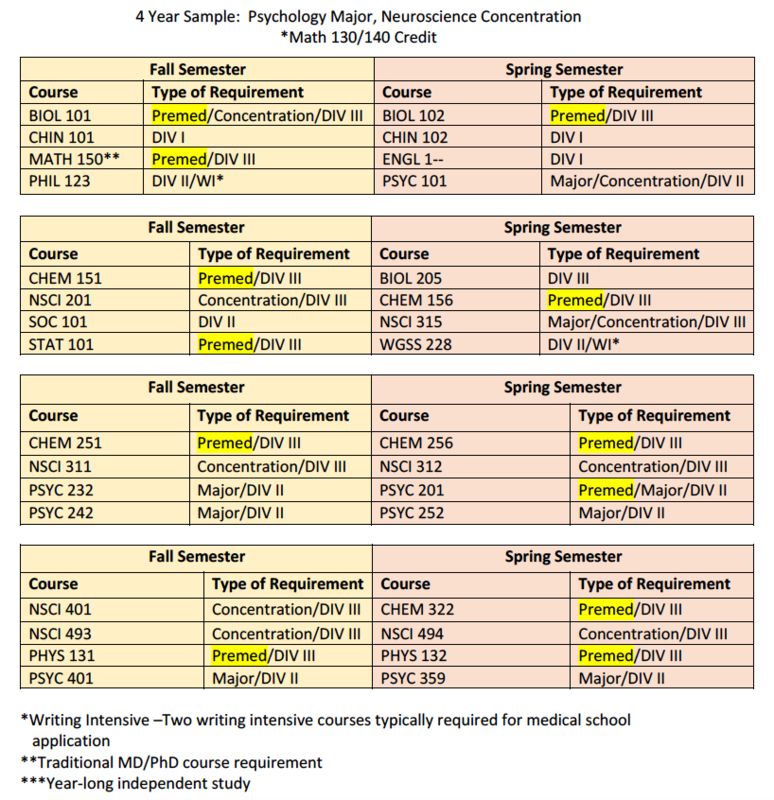 Typically, prehealth students enroll in BIOL 101 and CHEM 153 in the first semester of first year, but this is not mandatory and may not be appropriate for you. Choose a 100-level English course in the first year as entering students are often given preference. 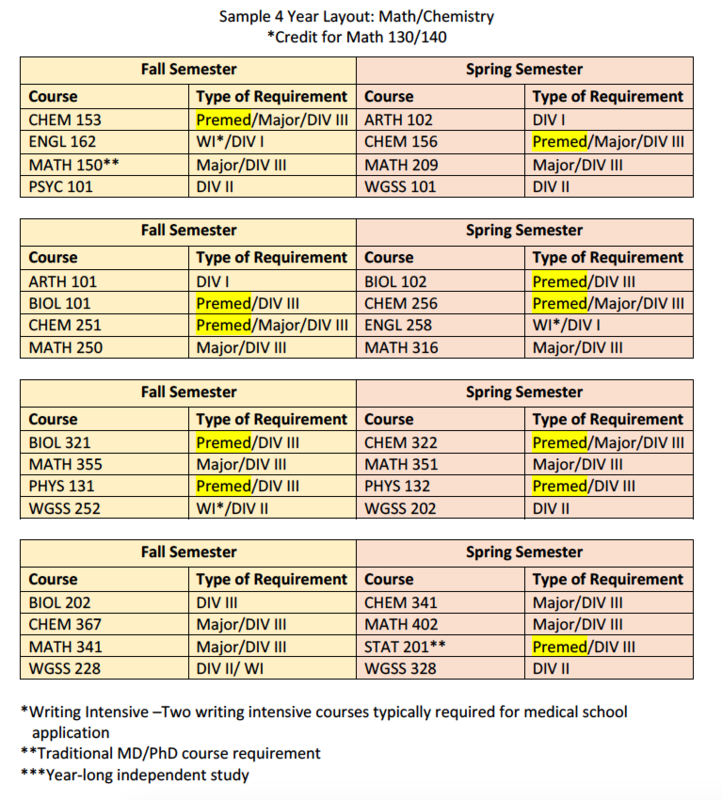 The minimum admission requirements of most medical and dental schools are satisfied by these courses. PHYS 131, 132 Introduction to Mechanics, Electromagnetism and the Physics of Matter. May fulfill with AP. MATH 130, 140, 150, or higher Calculus I and II, Multivariable Calculus, or one higher math course. May fulfill with AP. STATS 101, 161, 201 or PSYC 201 Introductory Statistics, Introductory Statistics for Social Sciences, Statistics and Data Analysis, or Experimentation and Statistics. Medical schools strongly recommend one statistics course. 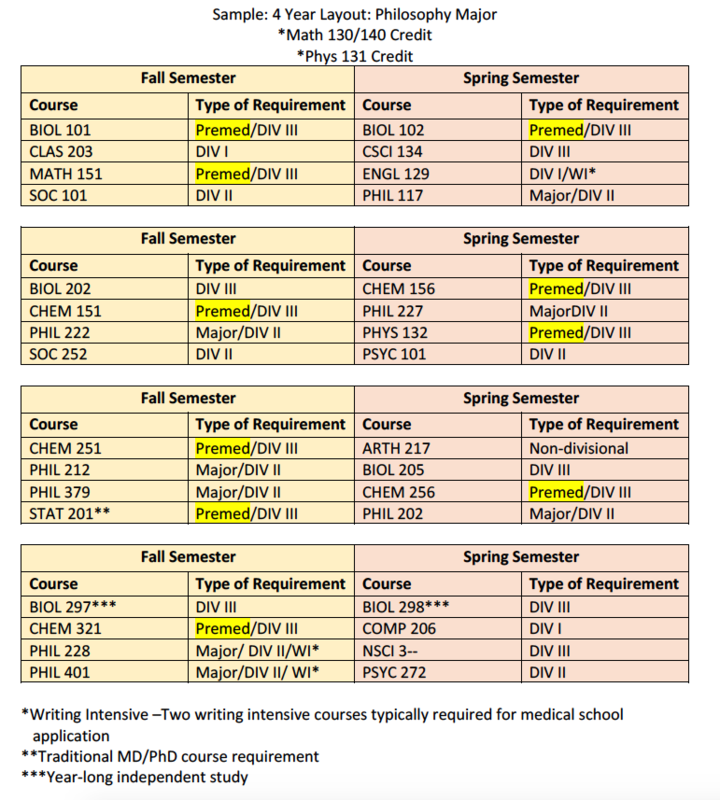 Some students elect to take courses beyond the minimum requirements because of their major, interest in the material, or additional requirements published by specific schools. 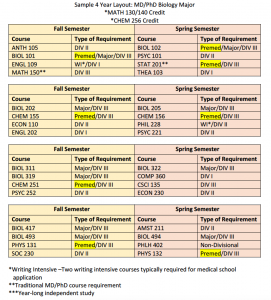 In general, you should not enroll in prehealth required courses during a study-away program or during the summer without consulting the relevant department and/or your advisor. The Williams-Exeter Programme at Oxford is the exception as it is a special curricular offering of the College. 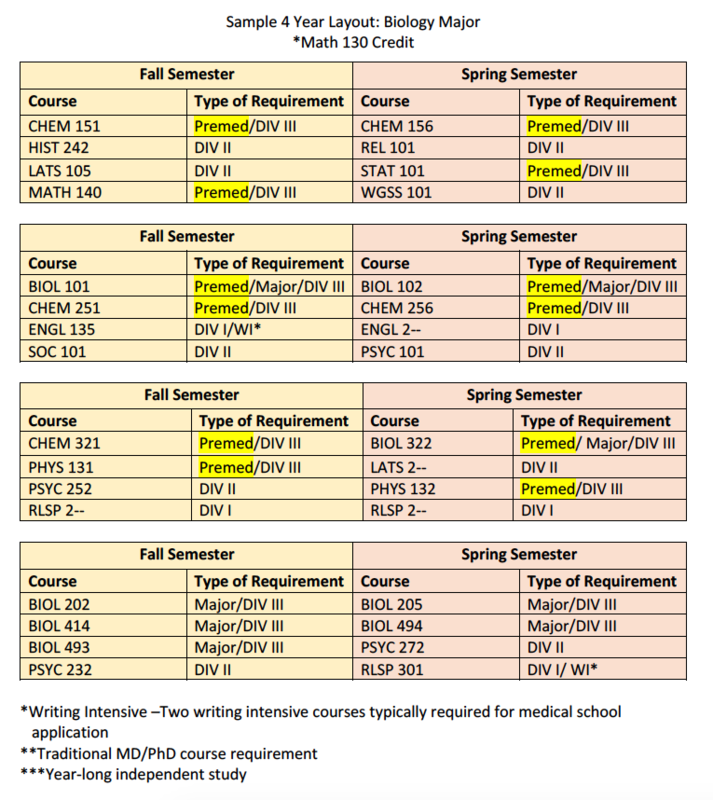 Exceptions to this rule include the need to fit in courses before or after a study-away program; or in cases when required courses conflict with courses necessary for your major; or if you made a late decision to prepare for medical/dental/veterinary school or another health profession. Your major is arguably the most important curricular decision in your college career, and among the least important factors in your medical school application. Professional schools do not prefer any particular major, though many applicants major in the sciences as a result of their interests. In the current 2019 application cycle, 50% of the applicants are Biology majors; 34% are Chemistry majors; and 28% are double majors. Other majors represented in this group are Art History (2); Economics (1); Psychology (1); Mathematics (3); and Statistics (1). Find your academic rhythm—the pace of coursework, assignments, and exams is fast! Explore extracurricular activities and choose one or two. Contact the health professions advisor if you want to get acquainted, make future plans, or discuss any concerns you may have. Read daily messages for information on departmental summer research assistantship opportunities. A RA job at Williams provides experience for applying to other research programs next summer. Apply broadly for summer internships. Remember you can apply for Alumni Sponsored Internship Program (ASIP) funding for unpaid opportunities. Get a job--the experience will be useful in terms of showing maturity and responsibility. Consider your academic strengths and interests. Explore career options in health care and public health. Meet with the health professions advisor to discuss your plans. Select your major based on your interests. You do not have to be a science major to go into a health profession! Engage in your community on and off campus. 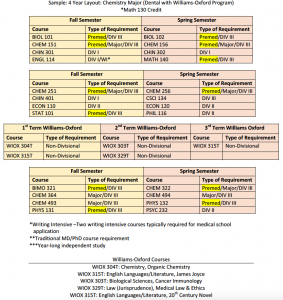 Map out your academic plan if you want to study abroad in junior year. Participate in an internship, meaningful activity, or job that assists your career exploration in either a clinical or research setting. Again, use ASIP for funding. Contact Ephs in a healthcare field through the Alumni Career Network or LinkedIn. Engage in a service-related activity. Perform well in courses, labs, and seminars. Discuss the strength of your application to graduate school or a professional school with your major advisor and health professions advisor. Continue your engagement in community service; consider a leadership role. Attend any departmental or career center info sessions or panel discussions related to your career interests. Consider a thesis project for senior year. 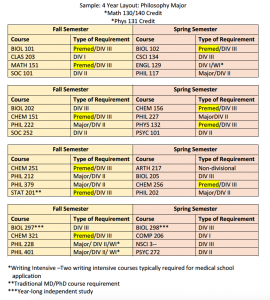 Complete the academic prerequisites or ensure you are enrolled in them in senior year. Attend the December meeting on application procedures and follow the application timeline on the website! 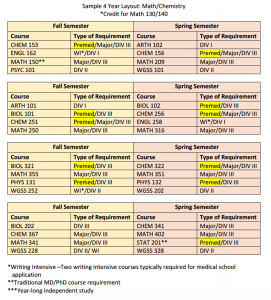 Study for and sign up for the MCAT this spring; same for DAT or GRE in the spring or early summer. Complete the “Intent to Apply” form, schedule your Health Professions Committee Interview, and begin drafting a personal statement. Begin your thesis research if required or appropriate. Participate in a research or clinical experience that will enhance your understanding of a career in science or health professions. 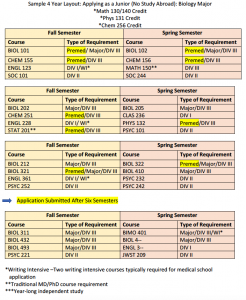 Complete your applications for med school, if hoping to matriculate after graduation. Complete thesis research and the final project. Maintain your high level of academic performance. Complete your secondary applications for health professions programs. Prepare for and go to interviews. Complete the academic prerequisites or plan to do so while working. Request letters of recommendation for the year in which you apply. Meet with the health professions advisor before leaving campus.